There’s no room in my extremely busy day for complicated recipes and tedious prep, so I made this super easy BBQ salmon with roasted veggies. This dinner is about as easy as it sounds and it’s super tasty too (and made leftovers, which means that I had a yummy piece of BBQ salmon on a kale salad, YUM). 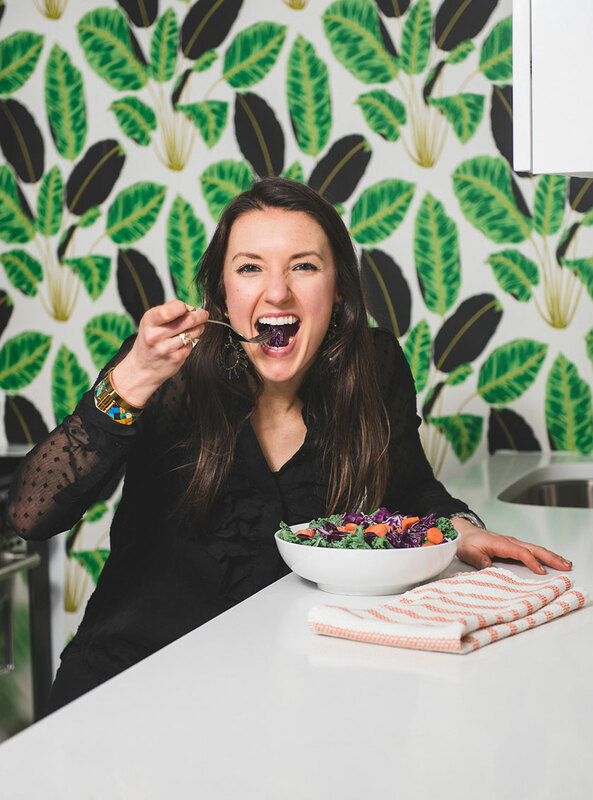 Additionally, it’s a nice swap out to chicken and poultry that so many of us eat on a far-too-regular basis. Eating fish and seafood is important for our health in general, there is research that eating fish just once may help reduce risk for Alzheimers says this study, regardless of the risk that fish consumption has with increased mercury levels in the body and the brain. Though the study found that the benefit to the brain exists with high mercury and lower mercury fish, it’s still important to be mindful of the type of fish we buy- aiming for wild and responsibly farmed (though wild is much better) whenever possible. Omega 3 fatty acid is a seriously important nutrient for our bodies and when we don’t get enough of it it can be negative for our mood, inflammation in the body and so much more. To make this recipe I simply used a favorite BBQ sauce from Stubbs, and paired with some salt and pepper for extra flavor. This yummy dish is super flavorful and a recipe that won’t add extra stress to your evening either. 2. Prepare the potatoes and the Brussels sprouts- by washing, cubing and halving- respectively. 3. In a metal baking dish or cookie sheet- toss together the potatoes with the olive oil, salt and pepper and lay on the baking sheet; and likewise with the Brussels sprouts. 4. Bake both the Brussels and potatoes in the oven for 25-30 minutes or until lightly browned and crispy. 5. Once the Brussels and the potatoes are in the oven, on a large baking sheet place the salmon skin-down, and spread the BBQ sauce all over the salmon, then sprinkle with salt and pepper. 6. Place the salmon into the oven and bake for 20 minutes. 7. 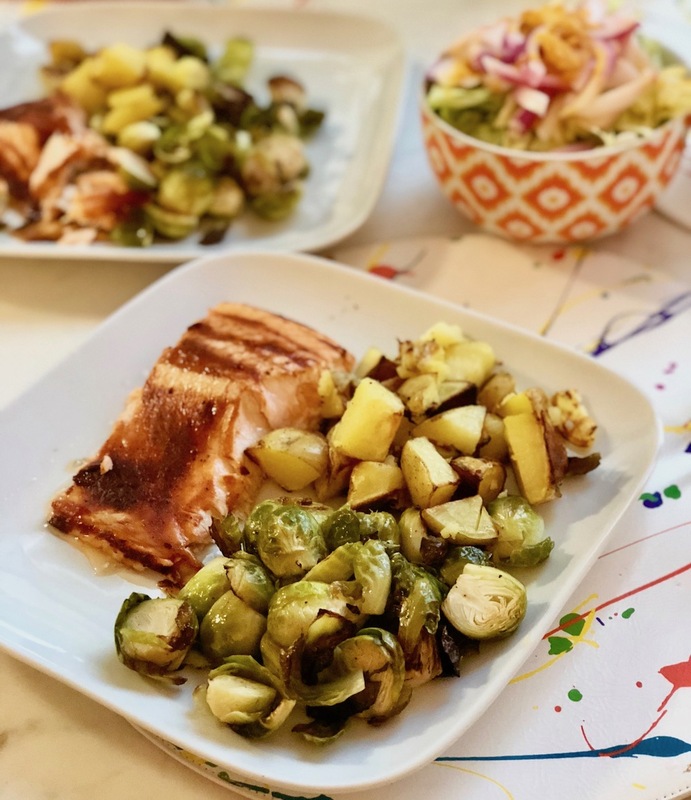 The salmon, potatoes and brussels should all be finished at about the same time– remove from the oven, serve and enjoy! Want more easy entree recipes? Click here!